The GTSD Chick Cam went live last week. For the first few days visitors watched eggs sit still in an incubator. Then yesterday the excitement began! As Ms. Cullen's class prepared to practice typing, students noticed some activity in the live stream embedded on the front page of the wiki. The class was able to witness a chick emerging from its egg. The students were quick to point out observations, share what they know about chicks, and ask questions about the process. Considering including a live stream in your classroom? 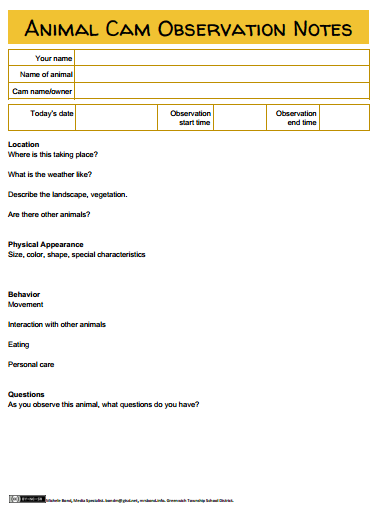 It may be helpful to provide students an observation form (see thumbnail at right). The template can guide students to focusing on the elements visible through the video stream, as well as a place for them to make notes about questions they would like to pursue. Contact me for access to the Google Doc version of this form; you can make a copy and customize this template for your curriculum needs. Below are just a few of the live animal cams available on the internet. Each of the sites listed is free, shows limited advertising, and does not require a login. Smithsonian National Zoological Park: Watch animals in their zoo environment: Asian small-clawed otter, clouded leopards, fishing cats, lion cubs, naked mole rat, orangutan, and pandas. San Diego Zoo: Streams available include panda, elephant, ape, and polar bear. The audio is generic nature sounds, not necessarily the sounds from the animal's environment. Animal Planet Live: Many different streams, including kittens, puppies, bunnies, hedgehogs, bald eagles, osprey, falcons, penguins, sharks, wild birds, Pacific reef, bees, sloths, cockroaches, and more. There is also a live stream of Big Foot, which may be a great way to introduce the topic of evaluating resources. USteam Animals & Wildlife: Ustream is a public site that allows anyone to stream a live event. This category includes all events tagged as animals or wildlife. Ustream hosts the Decorah eagles, Brooks River bears, and many other wild animals in their natural habitat. To find more, a simple web search for "animal live cam" will bring many results. Be sure to preview the site prior to sharing with students -- many include heavy advertising, require a login, are edited recordings, or are a completely manufactured presentation.